NCCF Director of Community Leadership Sally Migliore just returned from a meeting in the western part of the state, where affiliate leaders from that region met for an afternoon of conversation, updates and an educational component. 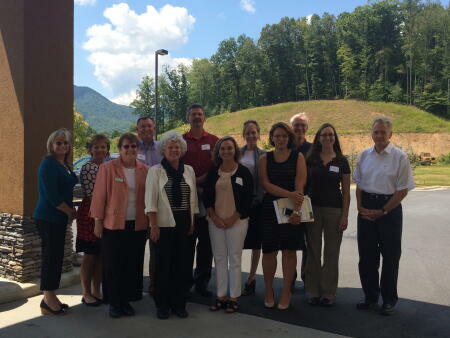 Migliore and Sue LeLievre, regional associate for the west, met in Dillsboro with one or two advisory board members from affiliates representing Clay, Graham, Haywood, Jackson, Macon and Swain counties, as well as the Eastern Band of Cherokee. Migliore also led the group in a session called “Facilitative Leadership,” which she believes will be helpful to enhance and support board leadership. Glenda Cheeks, also from Clay County, echoed the sentiment. “We learn from each other,” she said. “Each speaker brought value to the meeting, and I came away motivated,” she said. “I thoroughly enjoyed the meeting,” said Carla Icenhower of the Eastern Band of Cherokee affiliate. Migliore said she was looking forward to more regional meetings, which will be held across the state in coming months. “It was just so great to hear from our affiliate leaders in a smaller setting where we could all really benefit from the exchange,” Migliore said.